Will 2017 be the year Canadian media finally calls out Fraser Institute’s ‘Tax Freedom Day’ gimmick? It's time to end the madness of the Fraser Institute's junk "Tax Freedom Day" report once and for all. It’s time to end the madness of “Tax Freedom Day” once and for all. Every year around this time of June, the right-wing Fraser Institute stages a publicity stunt that falsely claims it took Canadians half a year to earn enough to pay off what they owe in taxes. • The Fraser Institute’s “average Canadian family” earns a lot more than what most Canadians actually earn and is not representative of the tax rates paid by the typical Canadian family. • The Fraser Institute also exaggerates the amount of taxes an “average Canadian family” pays by including every kind of tax imaginable – including corporate taxes plus oil and gas royalties. Now a new report by Richard Shillington and Robin Shaban for the Broadbent Institute goes further in debunking the methodology behind “Tax Freedom Day,” finding that the average tax rate is a little over half what the Fraser Institute claims. While the Fraser Institute claims average Canadian families pay over 40% of their incomes in tax, the report shows typical Canadians only pay a rate of 14% in income taxes – in fact, Canadians are among the lowest taxed in the industrialized world. 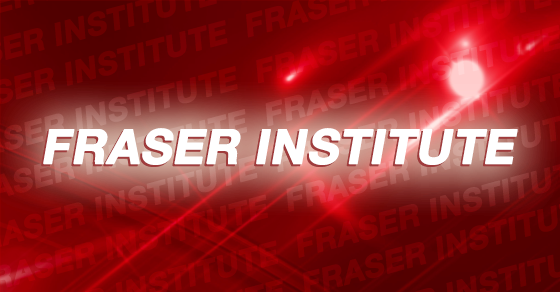 Yet despite widespread criticism of the Fraser Institute’s methodology – not to mention the fact the right-wing think tank openly admits its research is designed to push a “communications agenda” – Canadian media outlets show little interest in asking tough questions about the information they’re blindly passing along to readers and viewers. Here are some some numbers to back that up. An analysis by PressProgress of 178 “Tax Freedom Day” stories between 2011 and 2016 suggests the media is giving Canadians a distorted view of reality when it comes to taxes. For starters, only 18% of “Tax Freedom Day” stories over the last five years identified whose agenda is at work – four in five all stories failed to identify the Fraser Institute as a think tank with conservative, right-wing or otherwise right-leaning values. 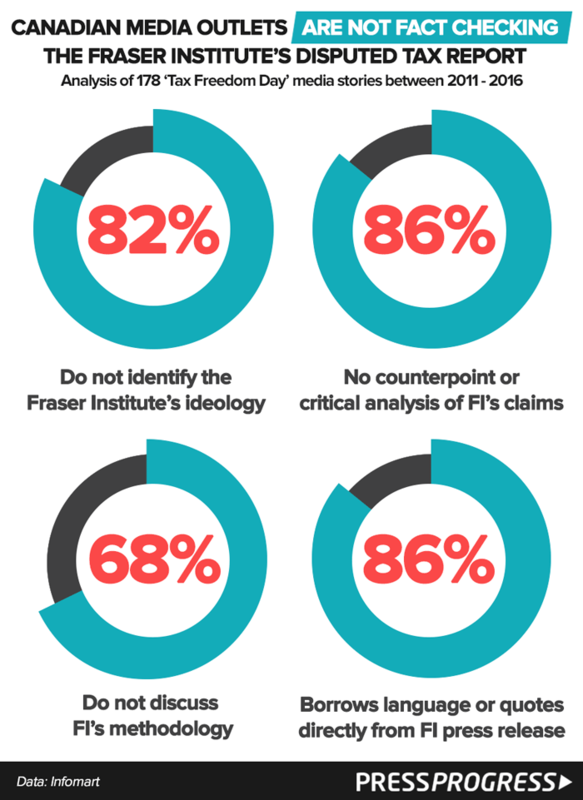 That’s especially problematic when you consider 68% of these stories offer no discussion of the Fraser Institute’s methodology and 86% fail to scrutinize the Fraser Institute’s claims or offer any counterpoint – 86% also appear to borrow the Fraser Institute’s ideologically-charged language straight from press releases. 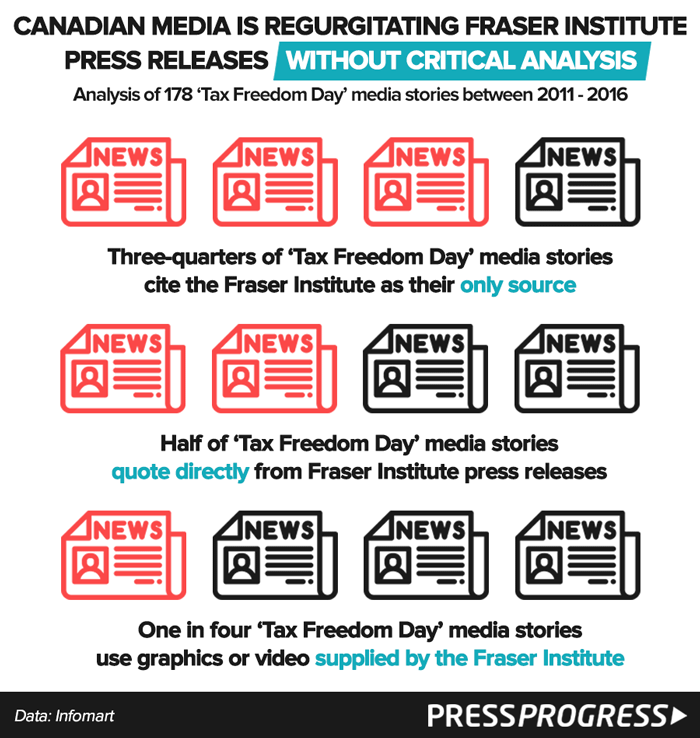 Unbelievably, the Fraser Institute has been offered as the one and only source of information in three-quarters of all “Tax Freedom Day'” stories since 2011 – no other information is offered to either support or challenge the Fraser Institute’s claims. 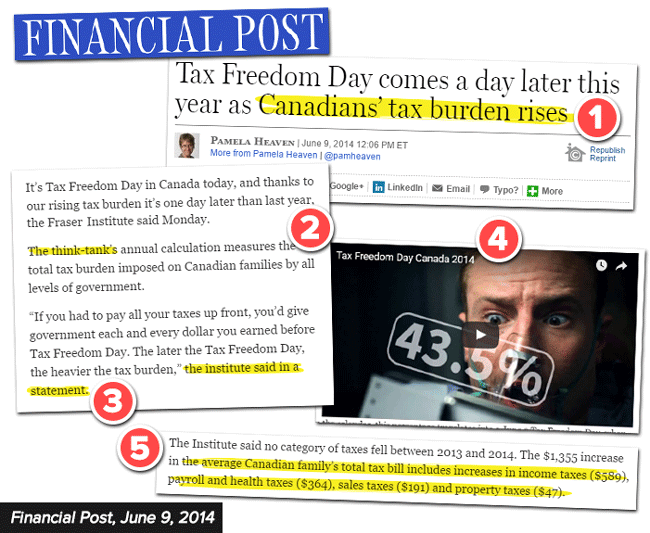 Meanwhile, half of all ‘Tax Freedom Day’ stories lift quotes straight from Fraser Institute press releases and one-quarter use communications products like graphics or videos supplied by the Fraser Institute. 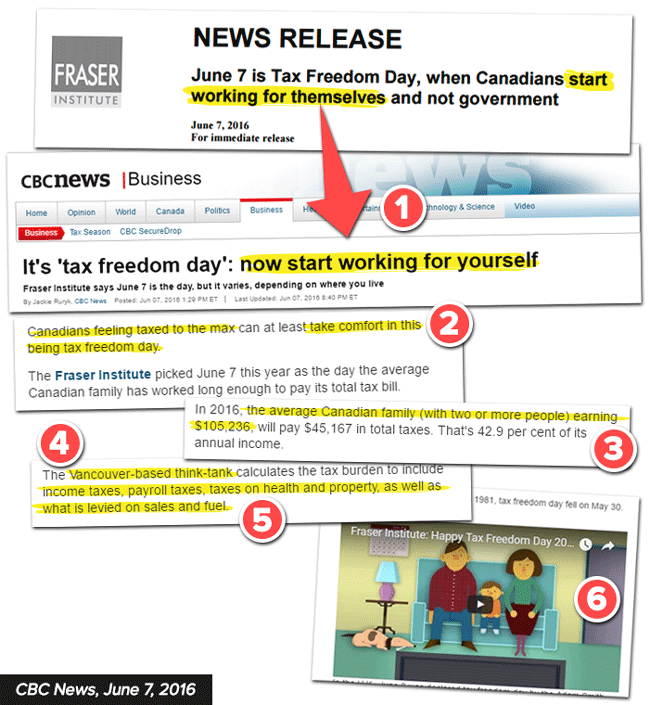 (1) CBC’s headline says “Tax Freedom Day” is the day you “start working for yourself” – that language is borrowed straight from the Fraser Institute’s own press release; (2) CBC echoes FI’s message that taxation is generally unpleasant; (3) CBC repeats FI’s claim that the “average Canadian family” earns $105,236 without noting past criticism of this figure (most Canadians are nowhere near that rich); (4) CBC identifies FI as a “Vancouver-based think tank” without no mention of its ideology; (5) CBC indicates FI includes different kinds of taxes in its calculation, but omits mention of corporate taxes or oil and gas royalties; (6) CBC embeds a YouTube video produced by FI to advance a right-wing anti-tax message. Why not take a look at another example published by the Financial Post back in 2014? What’s it going to take to get a little fact-checking around here? 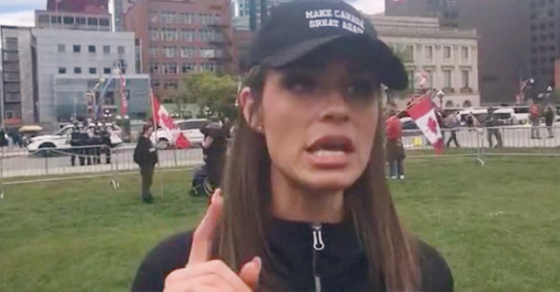 Rebel Media's Faith Goldy says Andrew Scheer is "our people." Rebel Media thinks Andrew Scheer is “our people”? Next time someone tells you the new Conservative leader is “mild-mannered” or “middle-of-the-road,” ask them why the alt-right thinks Scheer is “our people”?